China’s “new economy” looks most vulnerable to its stock market sell-off. Though the new-year slide in equity prices has dragged down valuations, private-sector companies still look relatively expensive. That could spell more pain for the stocks most beloved by the mom-and-pop investors who dominate Chinese bourses. Share prices recovered some lost ground on the morning of Jan. 8, after regulators suspended a “circuit-breaker” mechanism which halted trade twice since the start of the year. Even so, investors have had a stomach-churning week. China’s benchmark CSI300 index was down around 12 percent in the first four trading days of 2016, giving up all the gains it made last year. Some may view the slide as a buying opportunity. Companies listed in Shanghai now trade at 13 times historical earnings, according to Thomson Reuters Data – well below the average multiple of 20 over the past 10 years. But by international standards, they still appear expensive. Hong Kong’s Hang Seng Index, which includes many big Chinese groups, trades at around eight times earnings. The Shenzhen bourse, which is dominated by private sector firms, looks even pricier. The average company listed there is valued at around 36 times historical earnings, in line with the long-term average of 34. Small-cap companies listed on Shenzhen’s ChiNext board are at a dizzying 67 times. To some extent, those valuations reflect the underlying growth story. Shanghai is dominated by stodgy state-owned companies which powered China’s investment-driven growth over the last three decades and are now bearing the brunt of its economic slowdown. Meanwhile, companies operating in so-called new economy industries such as technology, clean energy and media have gravitated to Shenzhen. Retail investors love them, largely ignoring earnings performance as they search for companies they hope will dominate China’s faster-growing consumer-driven sectors. These stocks look most vulnerable to any renewed sell-off. That’s bad news for private sector companies trying to raise capital. And since the private sector generates most of the jobs in the People’s Republic, that in turn could be bad news for China’s future economic growth. 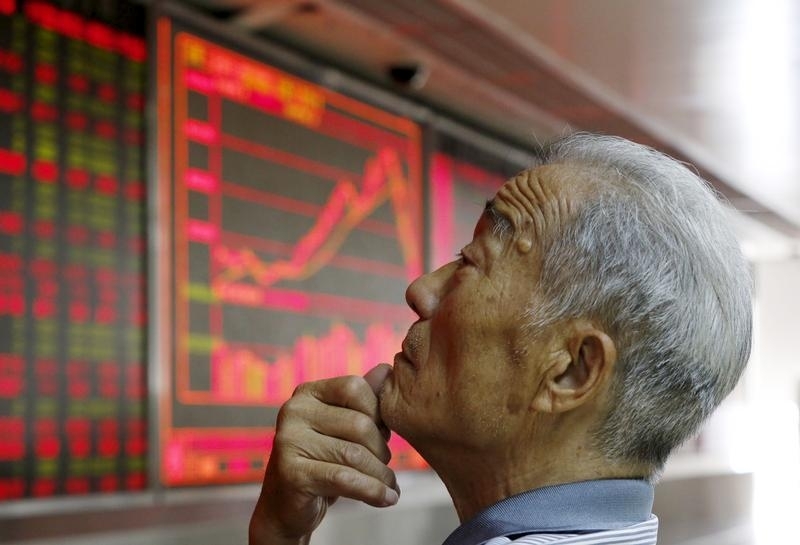 An investor watches an electronic board showing stock information at a brokerage office in Beijing, China, July 9, 2015. China’s major stock indexes rose in early trade on Jan. 8, following an overnight decision by the China Securities Regulatory Commission to suspend “circuit breaker” mechanisms which had amplified downward pressure on share prices. By midday in China [GMT 0300], the benchmark CSI300 index was up 2.75 percent at 3385. The index had previously lost 12 percent in the first four trading days of the year, giving up all the gains it made in 2015. Chinese stock markets have been buffeted by weak economic data, concerns about pending share sales by major stakeholders and the recent sharp depreciation of the yuan.